SLAs and capturing the amount of support that was given to a customer in a certain timeframe can be time sensitive. To ensure that you capture the moment in time, you can schedule a report to be emailed to you at the correct time. If your customers request reports from you, it may be easier to have these reports scheduled and emailed to your customers directly. Rather than having to remember to look over your monthly metrics by accessing the Reporting section, it may be more convenient to you for TeamSupport to deliver these Reports to your inbox on a scheduled basis. Email Subject: This field will be sent as the subject of the email for the report. Email Body: You may include any introduction to the report in the email body. This will be included in the Scheduled Report Email Template. 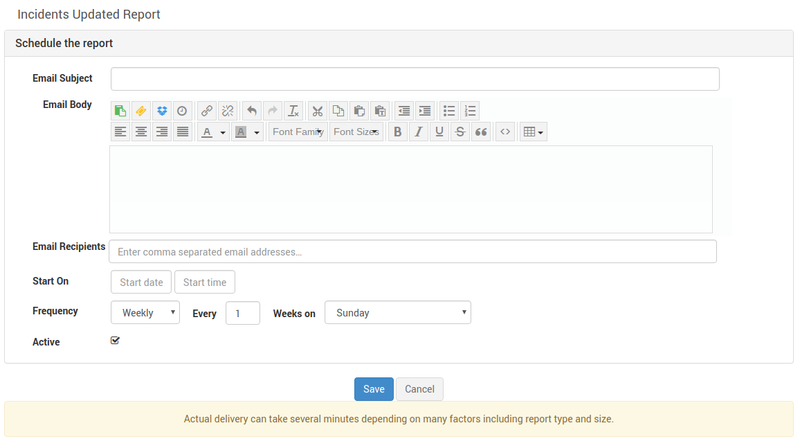 You may further customize this Email Template to include additional leading/trailing text and/or placeholder variables. Email Recipients: You may include one or more email addresses separated by comma. Start On: Indicate the time and date you would like the schedule to begin. Frequency: Allows you to run the report once, daily, weekly, or monthly basis. Active: Check this box to make the schedule active, otherwise, the schedule will not run. All of your Scheduled Reports will show on the Main Report Grid under the “Scheduled Reports” sub menu. Edit: You may click on the Schedule Report at any time to make changes. Green/Grey Clock Icon: A green clock icon indicates the report is active. A grey clock icon indicates the report is not active. Delete: To delete a Scheduled Report, click on the box next to the name, and click the trash icon. This cannot be reversed. Refresh: The refresh button can be used to refresh the grid if you are expecting to see changes.